A couple of weeks ago I wrote about and reviewed the Freedom Stick Bolt 4G USB modem from FreedomPop. The Bolt is a decent 4G device that allows your laptop to connect to free 4G internet from FreedomPop. While it has it's shortcomings (like no wi-fi connectivity for extra devices), in my tests it did seem to be able to pick up a good signal and provide high speed downloads. Not a bad choice for those looking for an internet connection on the go for their laptop. In my review of the Bolt I compared it to my other FreedomPop device, the Overdrive Pro wireless hotspot. The Overdrive Pro is my main wireless hotspot and I have used it pretty extensively over the past few months. It has become my main on the go internet connection. Today I thought I would write up a full review of the FreedomPop Freedom Spot Overdrive Pro wireless hotspot. NOTE: Head down to the bottom of the post for an amazing limited time 60% off hot deal on the Overdrive Pro + data package that the folks at FreedomPop have allowed me to extend to my readers! Is The Freedom Spot Overdrive Pro A Good Hotspot To Buy? When I got the Overdrive Pro in the mail it was in a simple black box with FreedomPop logo printed on the top. When you open the box there was just the device itself, some brief quick start directions, along with a USB charger. The device itself is a glossy black square, and is just over 2 1/2 inches long on each side. There is a round power button on the top, as well as a small LCD screen that will give you details about the device's connection, battery life, as well as allow you track your data usage in real-time. It also has a microSD slot for wireless storage access, and a switch to turn off audio connection notifications. There also a couple of other ports on the side which appear to be for external antenna or something along those lines. Many of the devices that FreedomPop sends out are refurbished, and my device was no exception. The device I received was apparently a Sprint device at one time as it had the Sprint logo on the top that was covered in black tape (which I removed). No big issue there, but just be aware that many of the devices are refurbished. The video below takes a brief look at the Overdrive Pro device. So what are some of the key details of the Freedom Spot Overdrive Pro? Works with 3G and 4G connections: If your 4G connection isn't that great, this one will fall back on a 3G connection. The Freedom Spot Photon that I used to have was 4G only, so I was glad to have the 3G on this one for bad 4G areas. Connect all your devices: It supports up to 8 devices at once. Compact: It's small enough to put in your pocket and walk around with without noticing it's there. Just over 3 ounces in weight and .7 inches thick. Good battery life: It has an advertised battery life of 6+ hours. I've found that to be about right, maybe slightly less if you're using it heavily. 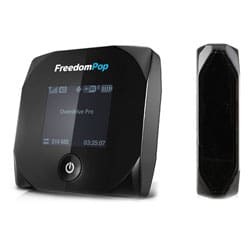 Easy to use: FreedomPop activates devices at ship date so they arrive ready to go out of the box. Just turn it on, wait for it to find a connection (usually pretty quick) and connect. Using the Freedom Spot Overdrive Pro is pretty easy once you get it setup the first time. It's just a matter of turning it on, waiting for it to find a 3G or 4G connection and then connecting to the device via Wi-Fi. The hotspot will come with a default SSID when you turn it on, which you will see on the screen. The password will also appear there as well. You can change that if you want via the settings interface – if you don't want the password to appear, or if you want to change the SSID. Personally, I like to change mine to something like “FBISurveillanceVan” or “TrojanVirus“. To manage your FreedomPop Mobile Hotspot when you are connected to it via Wi-Fi you can go to http://OverdrivePro in your browser. The default password for making changes in the admin interface is “password”. From within the settings screen you can make changes to the device firmware (checking for updates or uploading your own firmware file), activate the included microSD network drive, enable or disable audio notifications, set preferred networks, and make changes to security and network settings. Find the detailed manual here for full details on changes you can make. Freedom Spot Overdrive Pro – Good 4G connection: 7.79 Mbps download speed, 1.59 Mbps. Freedom Spot Overdrive Pro – Limited 4G connection: 1.07 Mbps download speed, 0.12 Mbps upload speed. Since I mainly use the device in good 4G areas, I'm pretty happy with the performance and speed of the device. The only thing I think could be improved was the reception of the device. I've found that at times it doesn't seem to have as good of reception as the other devices I've used, including the Freedom Stick Bolt and the Freedom Spot Photon. Others have had some success with external antennas. As I mentioned above you can insert a microSD card into the device and use it as network storage. I put a 16GB card that I had laying around into the device, and then was able to browse the card via my network places in Windows Explorer when I was connected to the hotspot. Seems like it could come in handy. The device has worked great since I've had it. The functionality that has come in most handy is the fact that it has both 3G and 4G connections. While driving around outside of the Minneapolis area where 4G is the best, having the 3G connection has come in handy more than once. It allows me to still check email, surf a bit or even stream Pandora. The fact that you can connect up to 8 devices has also come in handy. When my family moved into our new house in August we had a period of about a month where we had no internet connection at the new house. Luckily we were able to use the Overdrive Pro as our main internet connection during that time. After my son watched a couple of Amazon Instant streaming TV shows I had to upgrade our plan for that month, but otherwise it performed well. We were able to connect 5-6 devices to the Overdrive Pro, including our new Nest Wi-Fi thermostat. When you slip it into your pocket it's easy to forget it's there. The battery life for the Overdrive Pro has been pretty decent for me. I've had it turned on for 5-6 hours at a time before needing a recharge. The other hotspot I used, the Photon, had a similar battery life, although maybe slightly better since it had no screen. At the time that I wrote this the cost of the Freedom Spot Overdrive Pro is extremely affordable. When I bought the same hotspot with another provider (Virgin Mobile), it was over $100 for the same device. In fact, I just sold that device for $70. So you can't complain about the price of this device. For me the Freedom Spot Overdrive Pro is probably the best hotspot available for the FreedomPop service currently. That may not last forever as 4G LTE devices are on the way, but for now it's still my favorite. The Overdrive Pro has the benefit of having both 3G and 4G connections, as well as the benefit of being able to connect up to 8 devices. Take that along with the great download speeds I've been able to get in my main service area, and it's a definite winner. 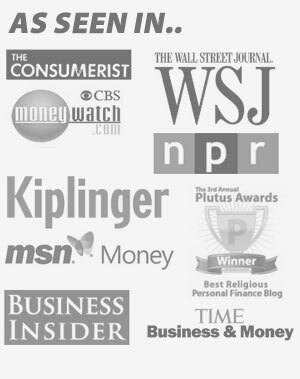 Previous Post: Is Gazelle Intensity A Long-Term Strategy For Staying Debt Free?